Prayer for Peace is the 8th studio album for North Mississippi Allstars. The album is self-produced by the Dickinson Brothers. It was recorded across the US at 6 different studios: including the famous Royal Studios in Memphis with Boo Mitchell & their legendary father Jim Dickinson’s Zebra Ranch in Hernando, MS. Special guests on the album include bassist Oteil Burbridge (Allman Brothers Band, Dead & Company), Graeme Lesh (Midnight North, The Terrapin Family Band), vocalist Sharisse Norman, bassist Dominic Davis (Jack White), and singer/fife player Shardé Thomas, daughter of Mississippi blues giant Otha Turner. 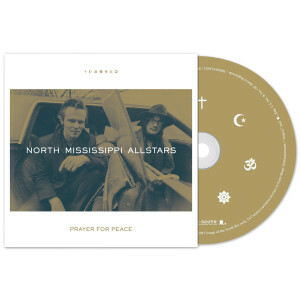 North Mississippi Allstars is a 3 time Grammy nominated band for Best Contemporary Blues Album. Click below to be taken to exclusive premiers of new music!